Spooky? Oh hell no. Enchanted. Yes. Marvelous. Yes. Spellbinding… in some ways. But I still prefer “Magical”; I picture sparkling lights and fireflies; children following the unexpected with their eyes, joyfully suspended in moments surrounded by warmth, laughter, and camaraderie, without a care in the world. That’s what last night’s, OUTSPOKEN event felt like to me; an evening filled with beautiful fireflies, and one to remember. All our performers brought. it. Aliza and I worked seamlessly – and in unison – during the course of the evening, managing changes, updates, and even one cancellation. The volunteers were excited to be there, and remained pro-actively helpful throughout the night. It was good to see some newcomers really settling into their QWOC+ Boston volunteers niche’s, talking to people about the organization, the events, our recent successes, me (haha! ), and the energy around them; it was clear that some of them were beginning to take on more ownership of our little grassroots organization. Everything was near perfect. But, for me, the secret ingredient to last night’s success was the age diversity in the room, and in the show. It started with our lineup. Letta Neely and Judah Dorrington, two pioneers that paved the way to raising awareness of LGBT multiculturalism in Boston via Black Pride, Sistah-to-Sistah, and various other community engagements, were in the house. It was such an honor, for those that knew who they were, and even – I dare say – those people who had no clue; time and time again last night the theme of old school partnering with new school was celebrated by hearty cheers, “Obama” call-outs, and moments of utter silence in reverence of the words of wisdom being spit on stage. I couldn’t have felt any prouder (or more humbled) to be part of an event that helped raise these women’s voices in our community today. Both Judah and Letta said to me at different points: “I’m proud of you”, and I got all choked up. As someone from a culture that values its elders – e.g. we don’t throw our parents into homes when they get old, they come and live with us instead – and grew up sitting in a circle with siblings, cousins, friends, listening to the funny uncle, or old grandmama telling stories of life, love, children, spirits that whistle in the night.. OUTSPOKEN was an event that felt as close as I could get to that part of home. My face ached from smiling so hard during Judah’s performance, as I watched her relish the opportunity she had to sing her heart out to a diverse crowd, and have FUN. It was such a delight. Judah and Letta brought some wisdom and perspective to the stage, alright, but Ignacio, Kay, and the Good Asian Drivers, reminded us all that our generation isn’t entertaining any ideas about letting the work of our pioneers be all for nothing. Ignacio Rivera not only sent so many women into heat (seriously, I saw so many fanning themselves as he was talking), he stomped on so many gender stereotypes within a minute of getting on stage. Sexual liberation is my new favorite thing now. I can’t wait to see his film during the Cinemental event later on this month! Kay Barrett did what I knew he would do. Political isn’t the word. White/class privilege annihilation would be a little too strong, but that dude held no punches when he got up there. “Where are my queer people of color?” I loved it! ‘Cause at events like that, white people show up sometimes and forget that it’s not about them. But in the spirit of unity, queer pride, recognizing those of us who can’t be as loud and that we must carry on our shoulders out love, I take my hat off to the Good Asian Drivers. Every single time I see Kit and Melissa perform, I am blown away. “Queer Nation” and “Red Guitar” are my two favorites, and I’d only just heard the latter! It was a beautiful way to end the evening, Kit speaking on our flaws even as queers, the sexism, racism, classism, and hypocrisy that we’re probably more vulnerable to as the ‘liberated other’; we have real problems, still. Melissa’s musical rage at the media and MTV, challenged us to think about who we are as consumers of pop culture, and urged us to speak up and against all of it! Wow. Thank you, Good Asian Drivers, for supporting QWOC WEEK and speaking to this particular crowd that needed to hear the truths of our community; we are all not queer-rated equally. A number of white people came up to talk to me afterwards, moved by QWOC+ Boston’s work and wanting to volunteer. This was wonderful. 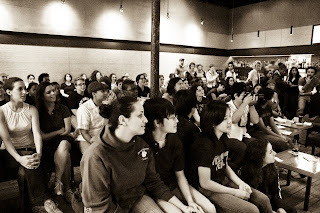 I am always very excited about white people who are ready to challenge themselves and their prejudices, especially since at events like OUTSPOKEN (and many other QWOC+ events in general), it’s very common to experience groups of white people showing up just to hang out with each other. They literally will not engage with anyone but other white people. So, they never learn anything, they never challenge themselves, and I have to continue dealing with ignorant comments/viewpoints on Obama whenever I bump into them. to avoid talking/engaging with others about these things. I wondered. But not for too long. ‘Cause yesterday wasn’t about privileged white people who have no wish to grow. 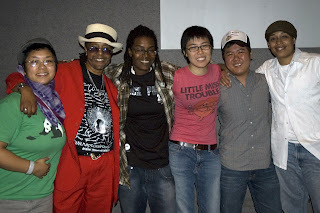 OUTSPOKEN was about creating a safe space for “outspoken” queer people of color – our black pride pioneers, our activist poets, spoken-word performers, immigrant self-defense teachers, and proud, sexually liberated trans-entities – being given a chance to speak, without any shade or color of resistance, even if it was just for one night.